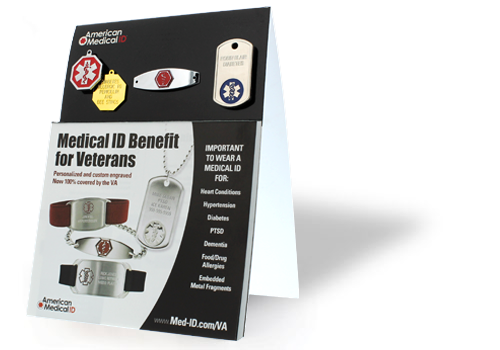 Medical IDs are indicated for veterans who have chronic conditions including diabetes, food or drug allergies, heart conditions, dementia, suffer from injuries including embedded metal fragments, rare diseases or any other medical or health related issue which should be communicated promptly in an emergency. Any VA clinician or approved healthcare provider may qualify veteran for a medical ID based on their medical condition(s). Clinician or provider submits the electronic consult to Prosthetics to be completed by a Purchasing Agent. Prosthetics communicates directly with American Medical ID for payment via secure fax line 713.695.7358. 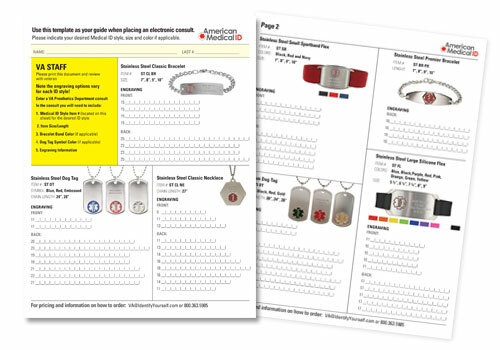 This guide shows available medical IDs with the line limitations for each option. This will ease the ordering process for you and Prosthetics. This form is not required to submit the order.